To make slaw, in large bowl, combine vinegar, olive oil, honey, cayenne pepper, cabbage and jicama. Cover and chill 3 to 4 hours, if time permits. To make the turkey filling, in large skillet, cook the turkey as specified on the package. Always cook to well-done, 165 degrees, as measured by a meat thermometer. Add fajita seasoning, broth, pepper, sugar and bay leaves. Bring to boil. Reduce heat to medium-low, simmer until all liquid is evaporated. Remove bay leaves. Fill each tortilla with turkey mixture. Top with slaw, jalapenos and sour cream, if desired. Serve with lime wedges, if desired. 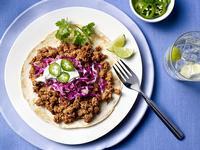 Ground turkey is high on versatility and low in fat - making it ideal for schools and healthcare. Jennie-O's ground turkey is available in a variety of sizes, is convenient to use and seasoned to fit the needs of most operators.